Bound with a collection of histories and documents relating to the Cistercian Abbey of Hailes, in Gloucestershire, the Chronicle of Hailes covers the period from Brutus--the Brut of medieval literature, a Breton who founded the kingdom of the Britains--to 1314, during the reign of King Edward II. The chronicle begins with a geographical description of Britain. 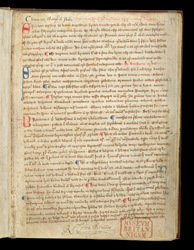 The inscription in black ink giving the title is later, dating from the 16th or 17th century, but the fainter inscription in red ink matches the handwriting in the text and is contemporary with it (about 1314). In the lower margin, the book's 17th-century owner, Sir Robert Cotton, signed his name.